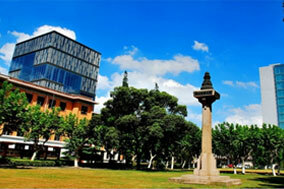 Tongji University School of Medicine (TUSM) started as the “German Medical School” in 1907 and has been committed to continuing its tradition of excellence in teaching, research and patient care. As one of leading universities in China, we maintain a dedicated and outstanding faculty of over 1300 physicians, surgeons and researchers, and bring together a group of diverse and talented students who are interested in becoming outstanding health-care practitioners and researchers. We have eight affiliated hospitals to provide a supportive environment to translate medical knowledge into daily patient care. The Bachelor of Medicine and Bachelor of Surgeons (MBBS) Program, initiated in 2011 at the TUSM, is a six-year undergraduate program which was taught in English and authorized by China Ministry of Education. You will study with dedicated faulty members, undertake research and clinical rotations with national top research teams and affiliated hospitals, and receive a globally recognized medical degree as Bachelor of Medicine and Bachelor of Surgery. You will also enjoy a dynamic campus life and meet students from all over the world. Our ultimate goal is to train doctors who are competent in the delivery of effective and ethical medical care in today’s rapidly changing health-care environment. We are delighted to have you with us together to explore the beauty of medicine. Wish all of you a bring future! TUSM strives for excellence via its tripartite mission of high-quality education, research and health service. The national “Excellent Physicians Training Plan” has been integrated into its education strategy. Every year, up to 150 students are enrolled into the undergraduate programs, 30 international students into the MBBS program, and 400 students into the postgraduate programs. TUSM graduates prove a 20-40% higher pass rate in the China National Medical Licensure Examination compared with the national average level. The research focuses of TUSM include stem cell/regenerative medicine, Immunology and infection diseases, Oncology, Geriatrics and Traditional Chinese Medicine (TCM), which bring more than 200 million RMB annual research funding and lead to more than 400 publications in renowned journals, such as Science, Nature and etc. each year. Eight affiliated hospitals with over 5000 registered beds in total are responsible for students' clinical training and internship. They own eight national key clinical research laboratories in thoracic surgery, gastroenterology, gynecology, occupational diseases, respiratory diseases, TCM, emergency medicine and nursing, and to provide a supportive environment to translate medical knowledge into daily patient care. TUSM has established partnership with universities and institutions all over the world, which provides our top 30% students with opportunities of research or clinical rotations, and provides our faculty members with opportunities of continuing professional training in well-known foreign universities as well. TUSM also participates in many international collaboration research projects and accommodates students and physicians from different countries, more than 70% from Europe and America for research and clinical training. The various international collaboration programs further contribute to TUSM's pursuit of its triple mission of education, research, and health service. MBBS students will be provided with opportunities for different scholarships. In order to qualify for a scholarship, applicants must meet the specified requirements. Scholarships are awarded based on the thorough evaluation of all merits in terms of academic performance,leadership competence and etc. Authorized by the state Ministry of Education, Tongji University School of Medicine (abbr. TUSM) started the Bachelor of Medicine and Bachelor of Surgery Program in 2011. The ultimate goal of this program is to train physicians and surgeons who are potentially competent in the delivery of effective and ethical medical care in today’s rapidly changing health-care environment. As one of the most leading universities in China (Top three in Shanghai), Tongji University has been committed to offering internationally-standardized medical education by means of its geographical advantage and disciplinary strength. At TUSM, there is always a large number of dedicated and outstanding faculty, as well as diverse and talented students from home and abroad. For MBBS program, all the courses are taught in English. The curriculum has been professionally designed to help students gain sound integrity, solid ground of medical sciences, systematic knowledge of clinical medicine and skills and the capabilities of problem-solving in patient care. The Courses are tailored so that students are able to take Physician Qualification Exams required by the relevant regulatory bodies of different countries to be doctors in their home country. Besides, MBBS Students are encouraged to take USMLE from the fourth year when they begin clinical courses. Eight affiliated hospitals offer increased opportunities for MBBS students to do clinical rotations in various clinical departments. Upon graduation, every eligible student is sure to receive a globally recognized medical degree as Bachelor of Medicine and Bachelor of Surgery (MBBS) from Tongji University. Copy of valid international passport. You will be required to confirm the offer and prepay CNY 6000 (to be deducted from your tuition) to secure your seat in the MBBS program by the expiry date noted on your Admission Notice. The Admission Notice and Visa Application Form (JW202) will be then posted to The School of Chinese Language.